Join Us To Promote Financial Literacy For Youth! OneUnited Bank is sponsoring the ninth annual financial literacy contest for youth between the ages of 8 – 12 years old. Simply either write and submit a 250-word essay (250 words not 250 characters) or create and submit an art project (PDF only) about what you learned from the book “I Got Bank!” (or from another financial literacy book available in your library or home) and how you can use what you learned in your life or the life of your family. You must have your parents’ permission to participate. Your essay or art project will be published by OneUnited Bank. All submissions must be postmarked or emailed by June 29, 2019. (Children of employees of OneUnited Bank are ineligible to participate.) Winners will be selected by OneUnited Bank in our sole discretion. Ten (10) winners will receive a $1,000 savings account by August 31, 2019 (with cooperation from parents). No purchase required. Awards are subject to 1099 reporting. To submit your essay or art project (PDF only), see details below. Please see our section about the Children’s Online Privacy Protection Act. Please see our 2019 Flyer. To participate, click here to fill out the form and have your parent(s) approve the form. 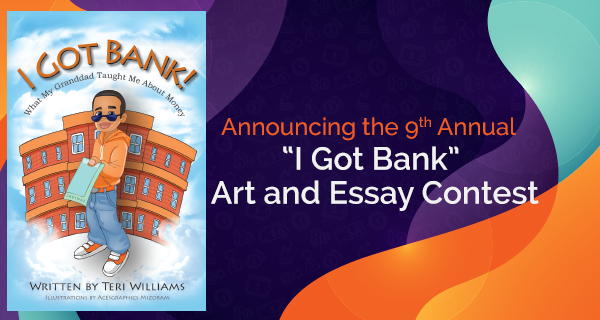 Submit your 250 word essay or a PDF of your art project by June 29, 2019 explaining or showing what you learned from the book “I Got Bank” (or from another financial literacy book available in your library or home) and how you can use what you learned in your life or the life of your family to OneUnited Bank, Financial Literacy Submission, 100 Franklin Street, Boston, MA 02110 or online. Winners will be announced by August 31, 2019.